Around 3.5% of children between the ages of 11 and 14 years, and 13.5% between the ages of 15 and 16 years were dropouts, while over 25% of children in grades I to VIII were absent from school on the day a team visited the school. 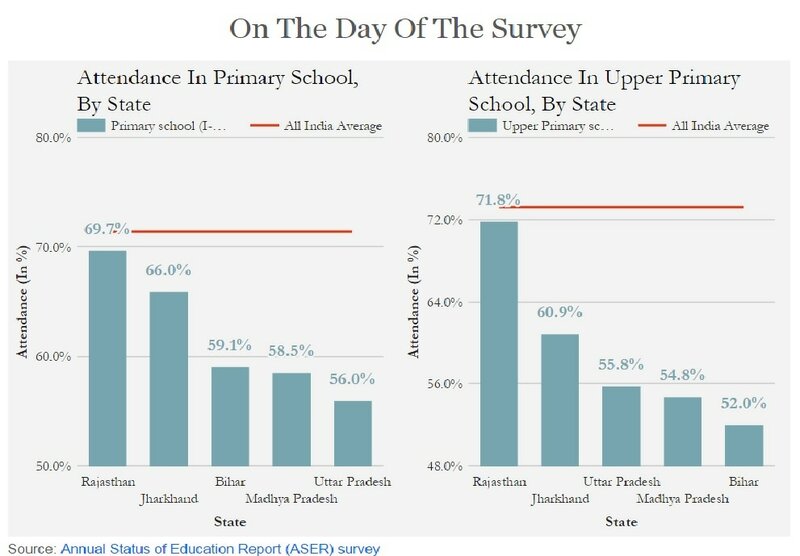 These are the findings of the 2016 Annual States of Education Report (ASER) survey, a household survey of schooling and learning levels in rural India. The survey included over 560,000 children between three and 16 years, in 589 districts of India. India’s almost universal enrollment in school hides these two major challenges of school education: High dropout and low attendance. Children dropping out or not attending school, has consequences: It results in loss in productivity of the education system as a high dropout rate increases per unit cost of school education, and reduces human resource development. Dropouts are likely to be engaged in semi-skilled and unskilled employment, according to a 2011 study by the National University of Educational Planning and Administration . In the policy context, for the present government’s “Skill India” and “Make in India” programmes to see even a modicum of success, it would have to address these two issues related to school education. Why do children skip school or drop out? Enrollment in school in India does not necessarily translate into attendance. At the all-India level, only about three-fourths of enrolled children attended primary (grade I to grade IV/V) or upper primary school (grade V to grade VII/VIII) on the day an ASER team visited the school in 2016. 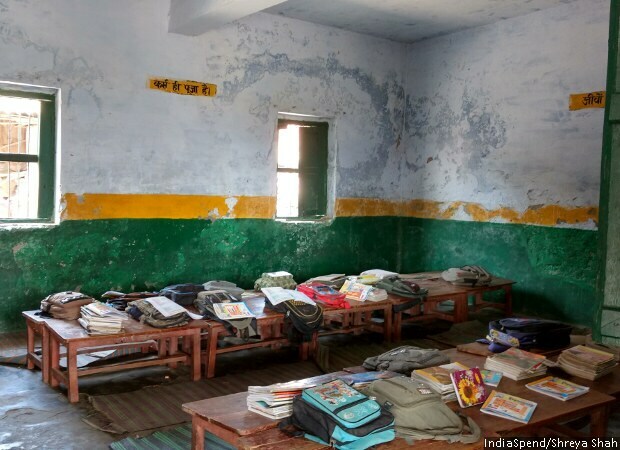 The problem of students dropping out, and absenteeism, is particularly acute in BIMARU (sick) states —an acronym for the less-developed states of Bihar, Rajasthan, Uttar Pradesh and Madhya Pradesh—that together have over 51 million children, or 46% of India’s total child population between the ages of 11 and 16 years, according to Census data. 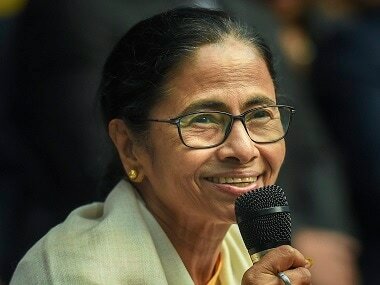 Within BIMARU states, this story also considers, Uttarakhand, Chhatisgarh, and Jharkhand which were carved out of Uttar Pradesh, Madhya Pradesh and Bihar respectively. Though the reason cited for dropouts in secondary schools is often access (such as “school is far”, especially, for girls), evidence shows that one of the most important reasons for dropping out is “lack of interest”, according to the ASER Centre’s Middle School Study, conducted in Nalanda district in Bihar and Satara in Maharashtra, between 2013 and 2015. The three-year study tracked the educational trajectory of about 6,000 children after primary school. A higher proportion of children in the age group 11-16 years who dropped out of school between 2015 and 2016 lacked basic reading and arithmetic skills, as compared to children who continued to be enrolled in school in 2016. It is possible that many students’ knowledge level is much below grade level, but that teachers teach students only at grade level, as one study from 2017 suggests. If children are being left behind in school and if no one in school engages with them at their level of knowledge, they might dropout of school. Though data on absenteeism are difficult to collect, and the relationship between learning and absenteeism is not verified empirically, it is reasonable to expect that those who attend school regularly have better learning outcomes than their peers who do not. Only 3.1% children in the age group 6-14 years were out of school, according to the 2016 ASER report, but there were variations in out-of-school children depending on the age group. ASER, a household survey, captures the enrollment status of all children, including out-of-school children, who have dropped out or never been to school. While only 1.7% of children in the age group 6-10 years–who would have been in primary school–were out of school, a higher proportion (4.6%) of children in the age group 11-14 years, who should have been in upper primary grades, were out of school. Dropouts are a bigger problem than children who never enroll in school. While 1.1% of children between the ages of 11 and 14 years never enrolled in school, 3.5% were dropouts, the ASER 2016 survey found. In the age group 11-14 years, BIMARU states–particularly UP (6.3%), MP (5.8%) and Rajasthan (5%)–have dropouts higher than most other states. 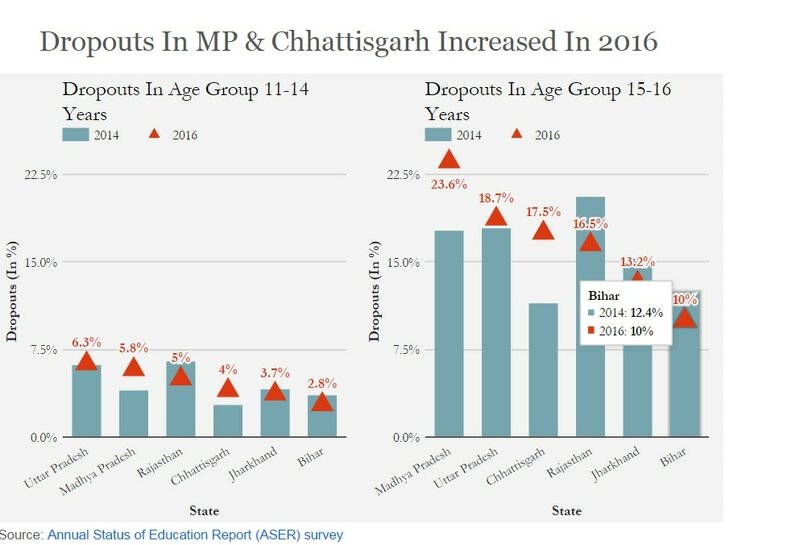 The proportion of dropouts in Chhattisgarh (4%) and Jharkhand (3.7%), part of MP and Bihar until 2000, is also above the all-India average of 3.5%. At the all-India level, the proportion of dropouts has remained stable–it decreased from 3.9% in 2012 to 3.5% in 2016. In contrast, 5.8% of sampled children in MP were dropouts, according to ASER 2016, an increase from 3.7 percentage points in 2010—the only state to see an increase in dropouts. The proportion of children out of school rises in the older age group of 15- 16 years–children who would have been in secondary school (grades IX and X). As many as 15.3% of children aged 15-16 years were out of school, compared to 4.6% of 11-14 years old children. Majority of out-of-school children in the age group 15-16 years (13.5%) were dropouts, according to ASER 2016 survey. Across India, Madhya Pradesh had the highest proportion of children in ages 15-16 years (23.6%), who were dropouts. Other BIMARU states–UP (18.7%), Chhattisgarh (17.5%) and Rajasthan (16.5%)–are among the top five states with the highest proportion of dropouts in the age group 15-16 years. 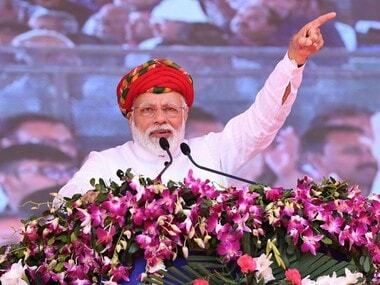 Gujarat, an economically advanced state when compared to the BIMARU states, has the second highest proportion of dropouts in India—19.3%–for reasons that are unclear at this point. Across India, the proportion of dropout children in the age group 15-16 years declined from 14.1% in 2012 to 13.5%, according to 2016 ASER data. For instance, dropouts in the states of Bihar and Jharkhand increased between 2010 and 2014, but declined in 2016. 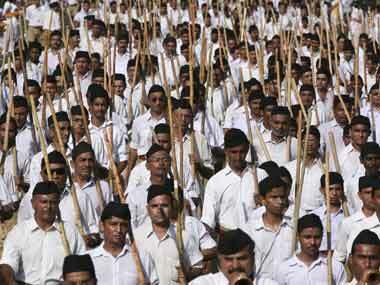 In other BIMARU states, no trend is discernible. For example, in UP, it increased from 17.6% in 2010 to 20.2% in 2012, but again declined to 18.7% in 2016. The proportion of dropouts in MP, on the other hand, has steadily increased from 11.6% in 2010 to 23.6% in 2016. Reasons behind the varying trends are difficult to understand, and we need further studies to understand the pattern of dropouts across states. Girls in the age group 11-16 years in MP, UP and Rajasthan are more likely to drop out of school as compared to boys. In MP, 28% of girls in the age group 15-16 years were dropouts, compared to 19.4% of boys. In Gujarat, 22.5% of girls were dropouts compared to 16.3% of boys. In other BIMARU states–Bihar, Jharkhand, Chhattisgarh and Uttarakhand–boys in the age group 15-16 years were more likely to drop out of school than girls. The reasons for differential gender trends across states is not clear and needs further research. Ashwini Deshpande is a research associate, and Manjistha Banerji is a senior researcher with ASER Centre.